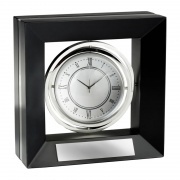 Silver plated desk clocks from Business Gifts Supplier .co.uk. Fine quality desk clocks and desktop clocks suitable for engraving as corporate gifts or merchandise and offered with free engraving of text and/or logos and no minimum order. Custom engraved desktop clocks are perfect as achievement or recognition awards, and an ideal way to maintain your brand awareness in front of key suppliers or clients, 24 hours a day. A top quality silver plated circular desk clock with curved base. Ideal for engraving as corporate gifts. Distinctive globe clock in gyroscope set within black bevelled base with engraving plaque. 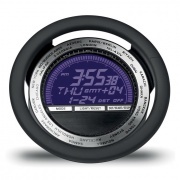 Stylish desk clock in steering wheel design with LED digital clock. Distinctive desk clock set inside rotating sphere, in curved metal frame. A minimalist 'tower' design silver plated desktop clock. Ideal for engraving as corporate gifts. Distinctive 6in dia circular metal frame holding acrylic dome with clock. 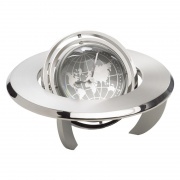 Futuristic looking gyroscope in polished metal, holding clock in sphere. Free-standing weather station in brushed aluminum frame, ideal for engraving. 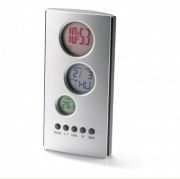 Modern tower design clock, calendar and thermometer with coloured displays and alarm / timer functions. 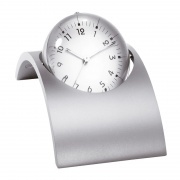 A quality and stylish ball-shaped desk clock in brushed chrome finish, set on a cut glass base.. 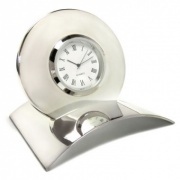 Simply stunning designer desk clock in superior quality silver plated finish. Aluminum square shaped pen or pencil holder with clock. A desktop accessory that can be engraved to create corporate gifts. 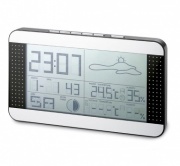 Versatile alarm clock with weather stations set in a sturdy case with folding stand. Featuring a sliding case that is ideal for engraving, and offered with free engraving of text and logos. 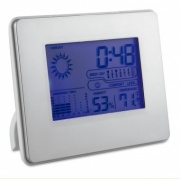 Multifunction clock and weather station in flat frame design with LCD display showing time, perpetual calendar, thermometers and hygrometer. 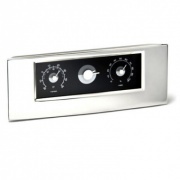 A high quality silver plated desktop clock in carriage clock style and with dual clock faces. 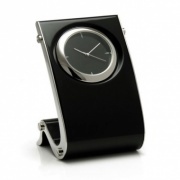 Desktop clock in distinctive wave shape design with a black high gloss finish and silver plated fittings. 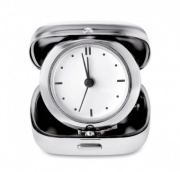 A superior quality silver plated travel desktop clock with alarm function and rounded folding case. Silver plated tri-fold clock with two photo frames, supplied in a lined presentation box. Ideal engraved as corporate gifts, awards or merchandise. 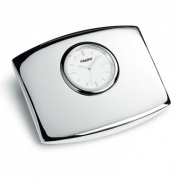 Featuring designer looks, twin clock faces, alarm function and fine quality silver plated finish. 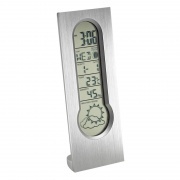 A large, free-standing three piece desktop clock, hygrometer and thermometer display in silver plated frame. 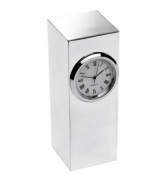 Stunning minimalist design silver plated desktop clocks. Ideal for engraving as corporate gifts or personalised recognition awards. 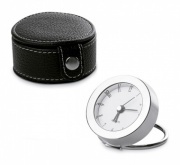 Silver plated swivel travel clock in lined presentation case, ideal engraved as corporate gifts or merchandise. Travel alarm clock made from hinged metal discs with polished finish, folds down to less than 3cm in height, with circular panel for engraving. 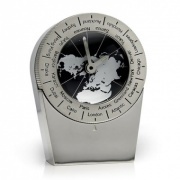 Folding world travel clock with leather case and silver plated fittings. 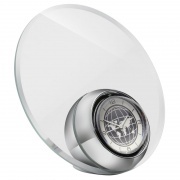 Silver plated world clock with automatic time zone function and 24 world cities on the dial. Luxury clock and compass set within hinged wooden box with polished mahogany finish and engraving plaque on the lid. Compact and sturdy travel alarm clock in metal hinged case, ideal engraved as promotional corporate gifts. Compact circular clock in metal frame with hinged stand, with leather carry case. 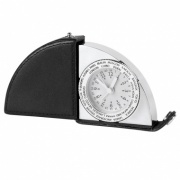 World time clock with aluminum face, on spinning frame with card holder. 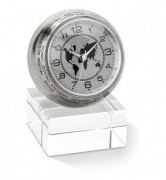 This collection of silver plated desk clocks and desktop clocks is offered with free engraving and no minimum order. Fine quality desk clocks and desktop clocks, ideal as corporate gifts clocks, promotional clocks, or engraved presentation items, offered with free engraving from Business Gifts Supplier. 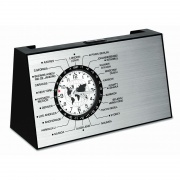 These silverplated desk clocks and desktop clocks are perfect for corporate gifts, incentive or achievement awards. Our clock picture frames and travel alarm clocks are ideal for corporate or sporting recognition awards. With a customised engraving, they are also ideal as bridesmaids gifts, groomsman gifts, graduation gifts or anniversary gifts. As we require a minimum quantity for these silverplated desk clocks, they are perfect for gift items that will be presented to a number of people. Customer who enjoyed these desktop clocks from Business Gifts Supplier also enjoyed our selections of silverplated business card holders and cases, engraved keyrings and silver plated photo frames. All these items are ideal for corporate gifts and, as with these desk clocks and desktop clocks, they are all offered with free engraving of text and logos.